Sometimes we get a customer that wants something a little different and we like to oblige that. This was a guy named Skip that owns a few furniture stores. This store was on Main Street in Littleton NH, about 3 hours away in the White Mountains. The first challenge was the stark white painted brick wall. It was hugh and needed some color. We ended up using a big painted panel behind the sign to change the appearance of the building. The first set of sketches we sent over got an OK reaction and upon further questioning he said he wanted something artsy like he has seen in Keene. 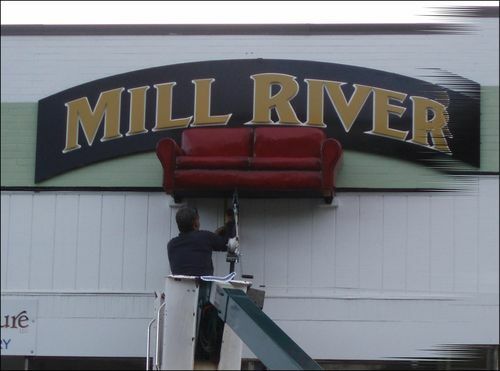 When I asked about the idea of using a life sized piece of furniture on the sign he liked the idea and asked if we could do a fabric covered couch. I wasn't sure how we would do it but I knew we could so I said yes and off we went. Skip requested an actual red leather couch from a catalog. After doing scaled drawing the size ended up about 2/3 scale so a Little smaller than life sized but still enough to make you look twice. We made the basic shape with plywood and epoxy then used chicken wire and fiberglass to build and shape the piece. When it was finished and painted it had a great leather look. This next shot is on installation day. What you don't see in this shot is the 30' long main panel which hadn't gone up yet. It had about a 30" arc to it so the couch appeared to be sitting on top. We even finished the bottom with dark colored screening so it looked real from below. The trip up to install the sign was long but worthwhile. The customer loved the sign and we were tired but satisfied driving home.